Emmanuel Ezunu, Head, Clinical Services and Training, Federal Medical Centre (FMC), Asaba, has confirmed the death of a housewife who died 15 hours after she was delivered of a set of quintuplet. Mr Ezunu who made the confirmation to News Agency of Nigeria (NAN) yesterday in Asaba, said Chukwunonso Onyejekwe, 29, died of complications after delivery. According to him, the deceased suffered acute respiratory failure and died after a successful Cesarean Session (CS) delivery. 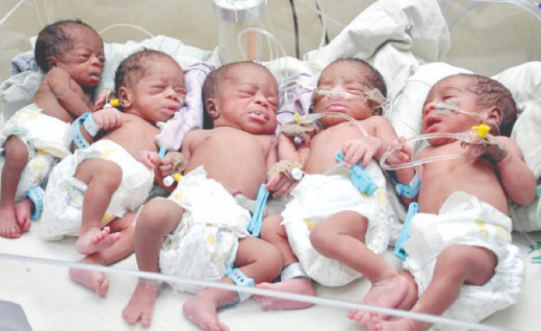 Late Mrs Onyejekwe was delivered of a set of five female babies. Mr Ezumu said that the woman was brought into the hospital as an un-booked patient, and due to her emergency condition, she was taken straight to the theatre. “Also, when she came, we noticed that her blood pressure was so high and the condition put her in a high risk for a normal delivery. “So, we recommended a caesarean session for safe delivery and she was moved to the theatre for an emergency CS,” he said. According to the medical officer, the woman never knew she was carrying a set of five babies. So sad! May her soul rip.